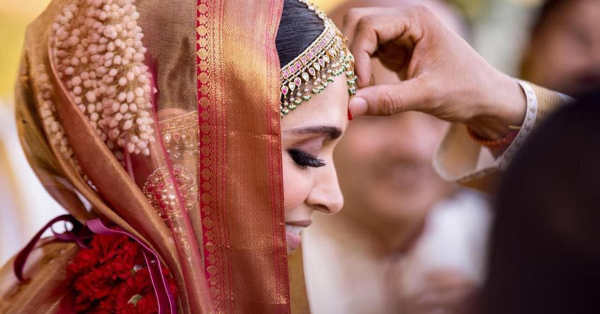 Attention Bride-To-Be: Deepika Padukone Broke All The *Shaadi* Makeup Rules! Deepika Padukone and Ranveer Singh might have just pulled off what seemed like the most secretive wedding in Bollywood. With absolutely no pictures being shared during their 2-day celebration, we FINALLY have photos from the hottest couple in B-town! And of course, they were totes worth the wait. And all I can say to all you brides is brace yourself, after Anushka Sharma's floral bun, Deepika's eye makeup is about to set the stage on fire! A smokey eye is probably one of the only beauty trends that have managed to stand the test of time. Timeless, classic and absolutely stunning this is one eye makeup look that won't fail you. It's definitely not the easiest eye makeup look to master but it's definitely one of those makeup looks that looks stunning on everyone. Deepika Padukone's makeup artist Sandhya Shekar set the bar quite high when it comes to creating that perfect bridal smokey eye. Brides, if you're looking for inspiration for your big day, warm-toned brown eye makeup looks wonderful on our golden Indian skin. Here's all the proof you need! Deepika has always had her heart set on an earthy palette for eye makeup and she chose to stay close to her roots for her big day too. Her makeup artist used warm hues of brown and a lot of kohl on her upper and lower lashline; smudged to perfection! Her matte smokey eye is a refreshing take on all the metallic, shimmery bridal makeup looks that we usually see. If you're going to smoke it out like DP, make sure that the rest of your makeup is toned down. Focus on highlighting one aspect of your face. If you're apprehensive about having an all-matte makeup look for your wedding, a quick scroll through the official #DeepVeer wedding photos will definitely change your mind. Photos from the #DeepVeer wedding can finally be seen on the couples Instagram accounts. They've posted the cutest, aww-inducing photos of one another. Now if those aren't what you call couple goals, we don't know what is! Looking for eyeshadow palettes to get Deepika's look? Here Are The Only Matte Eyeshadow Palettes You'll Ever Need! And if you're new to eye makeup, Here are all the A-Z's you need to know to get your eye makeup right!